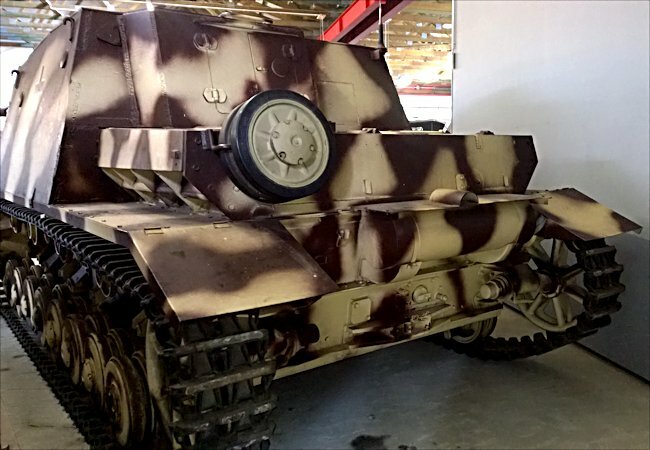 This late production German Sturmpanzer IV Brummbär 43 Sd.Kfz.166 infantry support self propelled gun can be seen at the Deutsches Panzermuseum in the small military town of Munster, Germany. The German army needed a weapon that could assist infantry units involved in urban warfare. They had learnt their lessons from battle such as Stalingrad. Hitler had ordered production of the Sturmpanzer IV in 1942. It was given the nickname Brummbär, which in English is best translated as grouchy, a bear with a sorehead. This name was not used by the German army. It was a name given to it by German speaking staff of the Allied intelligence Corps, in their reports about the vehicle. Its official designation was Sturmpanzer 43 Sd.Kfz. 166. It was designed to attack even the strongest fortification. Due to the range limit of the cannon it had to get close to its target. This is where the heavy armour helped. It was used to destroy enemy fortifications, machine gun strong points and buildings in which Allied infantry were sheltering. Armoured superstructure of this vehicle offered greater space and protection for the five-man crew of this combat vehicle compared with the standard hull and turret of a Panzer IV tank. It had 100mm of sloping protective armour at the front and 50mm at the side. At the battle of Kursk in July 1943, 16 Sturmpanzer IV Brummbar heavy armoured assault guns made their operational debut. 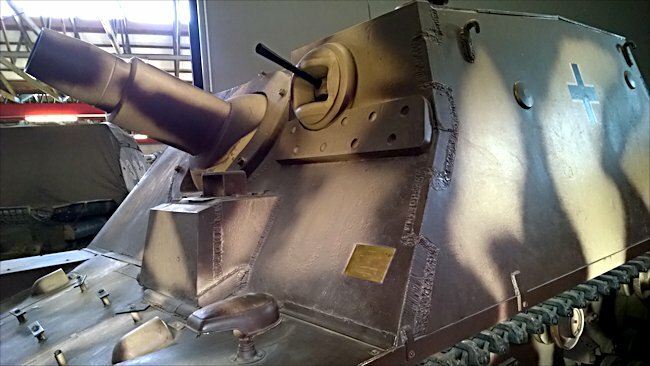 The 150mm Sturmhaubitze (StuH) 43 L/12 ball mounted gun was situated in a very heavy armoured casemate-style box. Although the gun was new and used existing ammunition. The shells fired by the Brummbar were used for the 150mm sIG 33 heavy infantry gun. The shells came in two parts. The first part was the high explosive payload. The second part was the propellant cartridge. The Brummbär could fire 38 rounds before having to be resupplied with more ammunition. The High Explosive HE round weighed 38kg. The Brummbar also carried a few anti tank armour piercing rounds. These AP rounds weighed 25kg. Both of these rounds packed a large wallop. The Sturmpanzer Brummbär rear track wheel could be easily repaired because of the good access. This also made it vulnerable from nearby exploding shells because of the lack of protection. The first version lacked a forward firing machine gun. 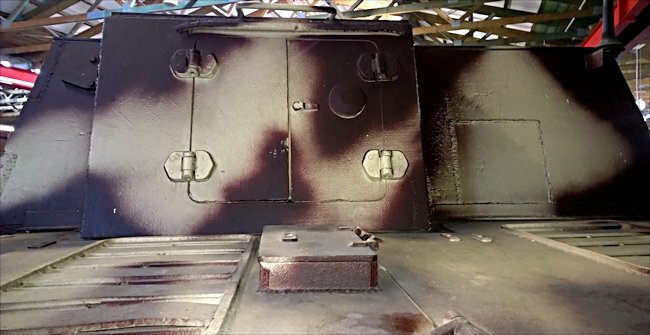 The drivers vision slipped was mounted low down on the front superstructure armoured face making this point a weak spot. These errors were rectified and later produced Sturmpanzer IV Brummbars can be identified by the periscope mounted on the drivers heavily armoured housing and the ball mounted machine gun position high on the left side of the vehicle next to the cannon. 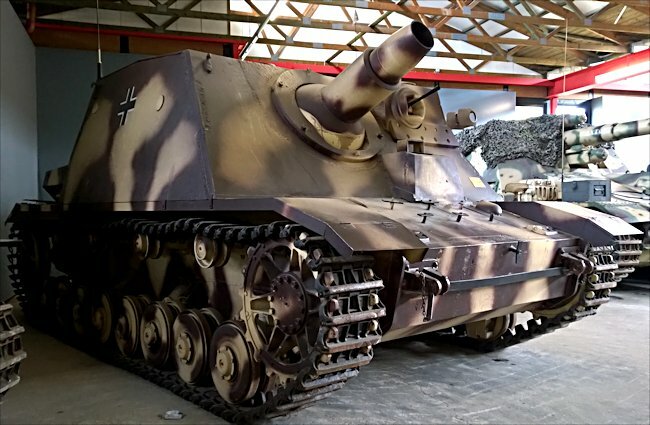 You can see these two features in the Sturmpanzer IV Brummbär preserved in the German Tank Museum in Munster. One thing that is missing from this Brummbar are the side skirts that were fitted to nearly all the vehicles to give added protection an infantry handheld anti-tank guns and bazookas. The side skirt mounting rails are also missing. 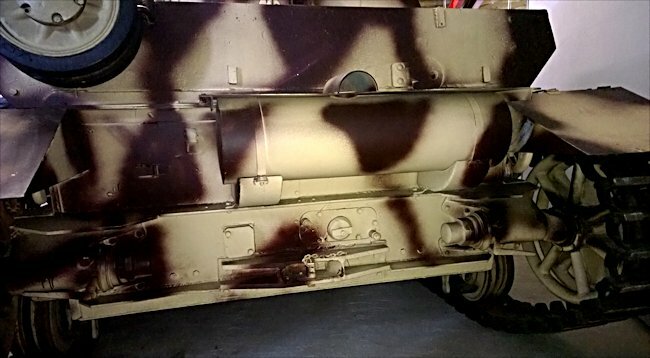 Another thing missing from the surviving example in Deutsches Panzermuseum Munster is the Zimmerit antimagnetic mine coating that was applied to all the exterior surfaces until September 1944. The German Armoured Assault Battalions, Sturm-panzer-Abteilung were nominally equipped with forty five Sturmpanzer IV Brummbar SdKfz 166. Only four such battalions were organised. One of them Stu.Pz.Abt. 217, was deployed during the battle of the Bulge in December 1944. Most of them were destroyed by rocket and bomb attack by the RAF and USAF ground attack aircraft, mines or by their own crew having to abandon them because of lack of fuel and ammunition rather than direct fire from another tank. 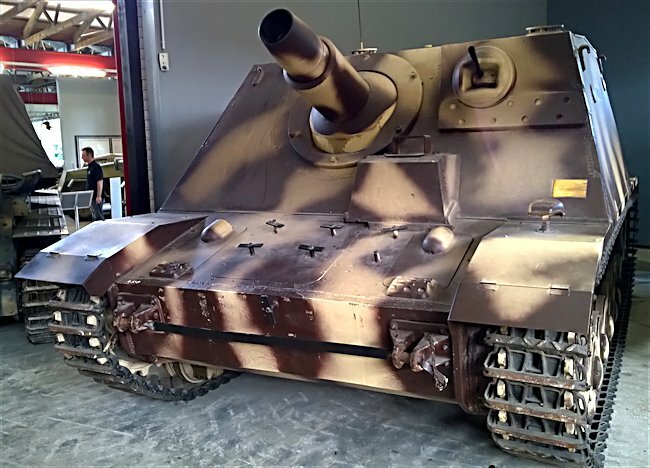 You can tell this is a late production Sturmpanzer Brummbär, the fourth and last in the series, because of the addition of a ball mounted machingun. It was in production between June 1944 and March 1945. That is Richard Cutland (The_Challenger) from World of Tanks filming a video about the Hetzer in the background. Sturmpanzer Brummbär carried spare track wheels in case of anti-tank mine damage. They normally carried four on the back.